It's often difficult to visualize how our daily consumption habits play out on a grander scale, how every water bottle we discard contributes to a growing, worldwide problem. A group of activists known as Luzinterruptus is providing one memorable visual in the form of a "Labyrinth of Plastic Waste." "We were looking to demonstrate, in a poetic manner, the amount of plastic waste that is consumed daily," Luzinterruptus explained in their statement. "In addition to focusing attention on the big business of bottling water, which leads to very serious problems in developing countries, whose citizens have watched as their aquifers have been privatized with impunity for the exclusive enrichment of large business owners and ruling classes without scruples." In May the artists did just that, traveling to Poland to partake in the Katowice Street Art Festival. 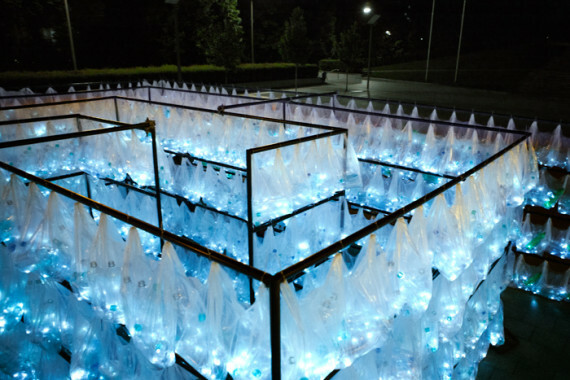 The artists spent four days crafting a 22-foot by 16-foot maze, stretching 11 feet high, comprised of over 6,000 water bottles. The unorthodox artistic materials came from a local manufacturing and bottling plant, where they'd been discarded for not meeting the standards required to sell them. The remaining bottles were donated by locals who contributed the bottles consumed during the four-day artistic process. The artists commented: "We can attest to the fact that in this city they drink bottled water in alarming quantities." 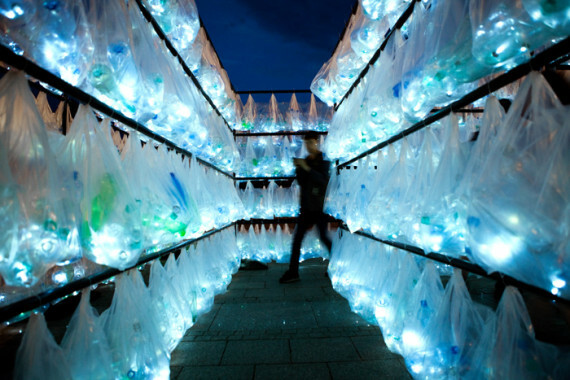 The water bottles, dropped into transparent bags and lit up with autonomous LEDs, were then suspended from a metallic structure to create a massive, maze-like structure. During the day, rays of sunshine pierced the colored plastic packaging, turning the stunning environment into a warped labyrinth of mysterious colors and shadows. At night the recycled corridors emitted a neon blue glow, imbuing the space with a strange sort of magic. The artists refer to it as an "intimate and shining chapel, with walls made of plastic, almost monochrome mosaics." The piece was up and running for two weeks, open day and night, after which it was disassembled and, not surprisingly, recycled completely. During the brief and wondrous life of the "Labyrinth Of Plastic Waste," viewers could experience the hallucinatory oddly beautiful and somewhat alarming sensation of getting lost amongst a maze of waste. The experiment in art activism feels less like an environmental lecture and more like a brief foray into Narnia, the green message coming through the immersive experience loud and clear. "We are very happy that in Poland it is finally compulsory to recycle," Luzinterruptus concluded. "Three years ago, when we were in Warsaw for the first time, they did not do it, but now it seems that the practice is taken very seriously." See the group's hallucinatory brand of environmentalism below.